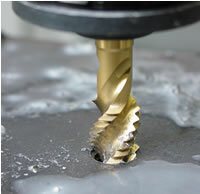 CNC Rigid Tapping Cycles. Two types included: Regular Rigid Tapping and Deep Hole Rigid Tapping. CENTROID's advanced rigid tapping cycles are simple to program thru G code, Cad/cam or Intercon. In intercon, you get an extra cycle called Deep Hole Rigid Tapping, (see a video here) Deep Hole tapping taps a hole much in the same way as you would by hand. It backs out of the thread to clear the chips and then matches right back up with the new threads and continues the tapping. Another advantage of deep hole tapping is that it allows you to tap a much larger hole than the HP of your machine would normally allow.